SOUTHERN CALIFORNIA — A manager with the University of Rhode Island’s Coastal Resources Center told attendees at a Jan. 29 seminar in Ft. Lauderdale, Florida marina and boatyard operators could face increasing costs to maintain, retrofit or upgrade their respective venues to prepare for or respond to the impacts of sea level rise. Pam Rubinoff, who is also a coastal specialist with Rhode Island Sea Grant, spoke at last month’s International Marina and Boatyard Conference in southern Florida said today’s high and king tides would be the new normal by the turn of the century. Higher tides could mean more coastal flooding and elevated water levels at marinas and harbors. Her outlook and advice were not limited to boaters and marina operators in Rhode Island or on the East Coast. Local environmental groups in Southern California have recently been echoing Rubinoff’s prediction of today’s high tides becoming the average level within the next 50 to 100 years. Orange County Coastkeeper echoed Rubinoff’s concerns at a recent press meeting during the most recent king tides on Jan. 21. Ray Hiemstra, OC Coastkeeper’s associate director of programs, said the most recent king tides events resulted in a 6-foot increase in sea level. The sea level at the peak of this year’s king tides events would be the average watermark during low tides in the next 50 to 100 years, he said. The most recent king tides events leave many questions unanswered. How serious is predicted sea level rise? Are public agencies taking preventative steps to limit the impacts of sea level rise (or keep the event from happening altogether)? What can marina operators do to be prepared for any rise in sea levels? Rubinoff, according to news reports, said marinas and boatyards can take steps to prepare for predicted sea level rise, such as installing flexible floating docks with pilings, storing important documents in elevated locations and finding ways to keep boats secure whenever the water level rises. An environmental law and policy fellow and Environmental Law Center director from UCLA School of Law published a report on how governmental agencies could combat sea-level rise. The report stated the Southern California coast is highly susceptible to coastal flooding and sea-level rise. “Research projects sea levels on the Southern California coast will rise 5 to 24 inches above 2000 levels by 2050,” stated Megan Herzog and Sean Hecht of UCLA School of Law in their published report. “Rising sea levels threaten thousands of coastal residents and billions of dollars of coastal property with increased risk of flooding, storm damage, shoreline erosion, saltwater intrusion ant wetland loss. “The impacts of sea level rise will be acute along the densely developed Southern California Bight, which spans from Point Conception to the Mexico border,” Herzog, UCLA’s Emmett/Frankel Fellow in Environmental Law and Policy, and Hecht, the law school’s Environmental Law Center executive director, continued. Herzog and Hecht added Southern California’s biggest challenge is to prepare its urbanized coast for sea level rise. California’s state legislatures have certainly begun looking into how to legislate potential sea level rise and coastal flooding. “Sea level rise is expected to cause many facilities servicing commercial fisheries – from ports, harbors, jetties and breakwaters, marinas, and panoply of service facilities,” the 2014 report by the Assembly’s Select Committee on Sea Level Rise and the California Economy stated. The 10-member select committee, which was chaired by Assemblyman Richard Gordon (D-Menlo Park) and included state legislators such as Toni Atkins (D-San Diego), said coastal flooding and sea level rise would place some segments of the California economy and infrastructure, such as fishing, ports, wastewater treatment, beaches, wetlands and coastal aquifers, at risk. The committee stated a few questions must be answered during the planning process, such as the most appropriate locations to “armor the coast,” where is adaptation necessary, and what areas to designate as ideal for retreat from the coastal zone. Complicating the state’s response to predicted sea level rise, according to the select committee, is a lack of funding. Hiemstra said we should expect sea levels increase by 2 feet within the next 35 years but there are steps we can take now to minimize the impacts. Hiemstra said both man and nature are to blame for climate change. “It is important to note that while some climate change is natural, the high speed change we are seeing is fueled by our own actions. Over the long term we will also need to consider a strategy called ‘managed retreat’ where we decide what areas are so vulnerable to sea level rise that we abandon them,” Hiemstra said. Newport Beach and Huntington Beach will need higher seawalls, Hiemstra said. He added marinas in those cities and other coastal municipalities will need to make infrastructure adjustments to accommodate a 2-foot rise in ocean levels. Other impacts from sea level rise include high surf, king tides and coastal flooding, according to Hiemstra. The 2013 UCLA School of Law report said whether Southern California’s coastal communities are resilient to sea level rise would depend upon what policies local governments enact to address the prospects of an evolving coastline. The California Coastal Commission and several local communities have begun looking into how to address predicted sea level rise. Santa Monica accepted a $235,000 grant from the California Ocean Protection Council in 2014 to study the impacts of coastal storms and sea level rise. 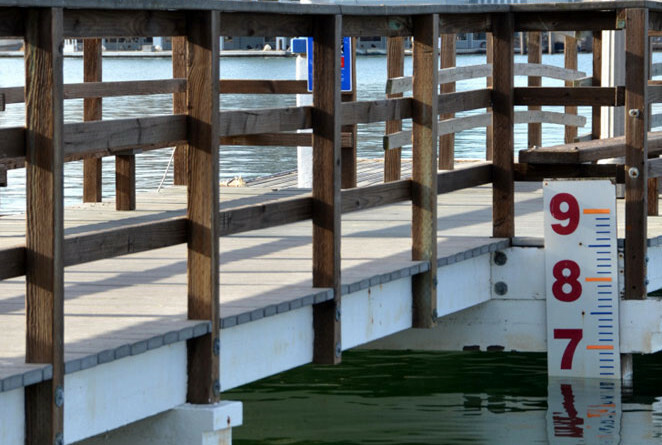 The city of Newport Beach have been discussing how to address aging seawalls in its harbor to prevent predicted coastal flooding and limit impacts of sea level rise on the local boating community. In October 2015 the Scripps Institution of Oceanography in San Diego launched the Center for Climate Change Impacts and Adaptation to study sea level rise and develop strategies of how the state’s coastal communities could best adapt to potential coastline changes. Coastal commissioners adopted a guidance document in August 2015 to help local and state leaders adapt to variations of sea level rise, should it occur, within the next 50 to 100 years. California has the third longest coastline in the nation, behind Alaska and Florida. An estimated 75 percent of the California population live along the state’s bay and coastal shores, according to the Assembly’s Select Committee on Sea Level Rise and the Economy. There are several websites offering sea level mapping tools, such as NOAA’s digital coast sea level rise and coastal flooding viewer (coast.noaa.gov/digitalcoast/tools/slr) and a federal government data portal (data.gov/climate).